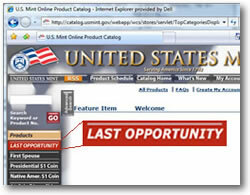 The United States Mint this week enabled its online "Last Opportunity" store page, providing last chance notices and ending sales dates for several coin products. Two gold coins, two silver coins, a clad set and two medal sets are among the products that will go off sale in December. The U.S. Mint’s last chance website section has been rolled out several times since 2008. The last major notice occurred in May 2010 when the Mint listed ending sales dates for products with 2009 Lincoln cents. A brief overview of each coin product listed in the latest last chance round follows. The Taylor coins debuted December 3, 2009. The proof is currently listed for $829 and the uncirculated is at $816. Each has current respective coin sales figures of 4,617 and 3,320. It has become standard for the Mint to end sales of older First Spouse Gold coins when newer versions become available. The Mary Todd Lincoln Gold Coins will go on sale at noon ET on December 2. They are the final 24 karat gold coins that will be issued in 2010. The DAV commemoratives were released on February 25, 2010. By law, the Mint can not sell them beyond 2010. The proof coin is listed for $43.95 and the uncirculated coin has a price of $35.95. The latest silver price guide shows 245,905 of the maximum 350,000 have been sold. Collectors are favoring the proofs by a 2.4 to 1 margin. The $14.95 priced clad quarters set has been around since January 5, 2009. The set is the oldest product offered by the Mint, with current sales figures at 624,186. It contains proof quarters honoring the District of Columbia, the Commonwealth of Puerto Rico, Guam, American Samoa, the U.S. Virgin Islands and the Commonwealth of the Northern Mariana Islands. The companion silver quarters sets sold out last week. Each medal set has a price tag of $8.95. The Polk set includes an uncirculated dollar featuring James K. Polk and a bronze medal showcasing a likeness of the Sarah Polk First Spouse Gold Coin. 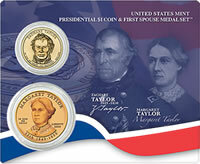 The Taylor set includes an uncirculated Zachary Taylor $1 and a bronze medal featuring the likeness of the Margaret Taylor First Spouse Gold Coin. Phone orders may be placed at the Mint’s toll-free number at 1-800-USA-MINT (872-6468). What is the status of the 5 ounce silver reproduction of the American wildlife sites?